Avon Ideal Flawless Liquid Foundation & Shine Attract Lipstick - first look! This evening I met Jackie Tyson, celebrity make up artist with over twenty years of experience in the industry and all round gorgeous lady who was on hand to talk to us about the new products that are coming up from Avon. Jackie was the head of make up for the contestants in the X Factor live shows for 6 years but have no fear ladies, she didn't have to do Wagner's make up. Phew... She's now the director of Serene Artist Management and also the Celebrity Make up Consultant for Avon. 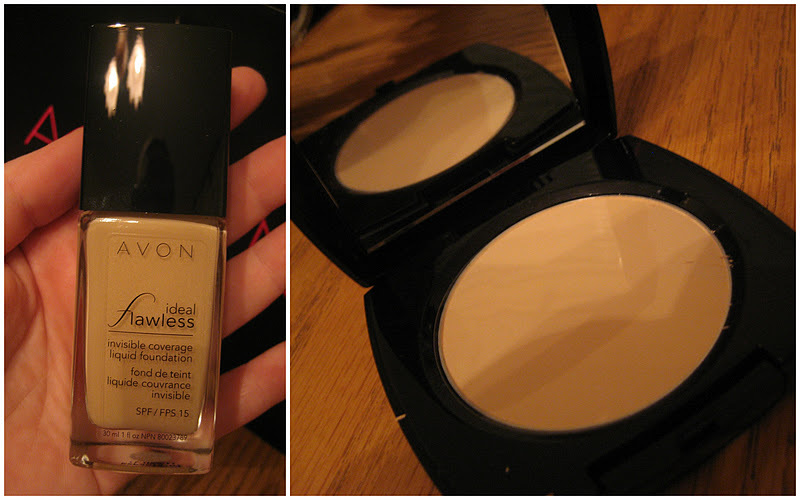 First up is Avon's Ideal Flawless Liquid Foundation, available from February 2012 in a fantastic 16 shades and a very reasonable €15.50. It uses the aptly named InvisiBlend Technology and I think you can figure out what it does from the name! Formulated with OptiLux pigments which allows light to pass through it's multi-shaped pigments, giving you a flawless and natural looking base. I think we can all safely say like the idea of flawless and natural looking eh ladies? So often, flawless means you have to cake the make up on and bye bye to natural looking anything. Avon is offering to give us both, so who are we not to give it a go! Coming out too is the Ideal Flawless pressed powder, so anyone who needs a bit of extra coverage will like this. More on that soon. We played around with the foundation and it has the most beautiful finish to it, it reminded us all of Revlon's PhotoReady foundation but it's more pigmented and thicker in consistency. Full review will follow soon of course. Next is Avon's Shine Attract Lipstick, a lip colour and shine in one product. Em, Avon, have you been reading my mind by any chance? I am in a constant battle with my dry lips and sometimes avoid wearing lipstick at all because it just enhances the dry patches. The inside of the lipstick bullet has the colour and outside that is a clear gel. The lipstick gives the colour (obvs) and the gel, which has vitamin E if you don't mind, gives both moisture and shine. Right up my street, right up there thanks very much. This is available in ten shades, from nudey colours like Natural Glow all the way up to vivid shades like Orchid and Passionate. I actually "oohed" in front of Jackie Tyson when I swatched a couple of these on my hand, they are absolutely gorgeous and I can't wait to tell you more about them! They will retail at €11 and are launching in January 2012. So that's the first look ladies, we'll have swatches and reviews soon so stay tuned! ooooh looks nice! i used to be an avon lady when i was in high school,heheh, havent bought anything from them in about 10 years though! i wonder how light the foundations go,the only one ive found that matches me is lily lolo porcelain but id love a liquid! Those lipsticks look lush! Especially because I'm a massive fan of bold colours but lipsticks usually dry me out. I reckon the gel will be moisturizing enough for me to be able to wear them though. Eeep. I'm excited to try them! thanks karen :-) i dont have very high hopes though ive never had a liquid foundation that has matched and i have tried everything! but still it would be good to see swatches! Great post K, I was really impressed with the products too. Can't wait to give them a proper play. The lipsticks look and sound great.